Chelsea star man Cesc Fabregas has warned Manchester United ahead of their meeting on Saturday at Wembley. Fabregas has tip Eden Hazard to make the difference in the game and he believed the Belgian presence can hurt the United Side. Though Hazard has not been able to make much difference in the past meeting with United as Mourinho has a tactics of keeping him down. 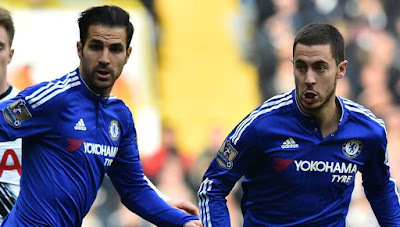 Fabregas as now backed Hazard to hurt Manchester United this time around and also reveal how disperate Chelsea are to win the FA Cup. United will also look to win the FA Cup and they won't like to end the season without a trophy and Mourinho will do all his best to stop Hazard again. Who do you think we win the FA Cup, Chelsea or Manchester United?